2) 'Michael Jackson Died' on Yahoo! 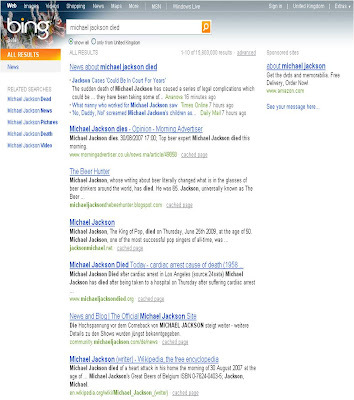 Cuil.com results are really struggling to contextualise the search for 'Michael Jackson Died.' 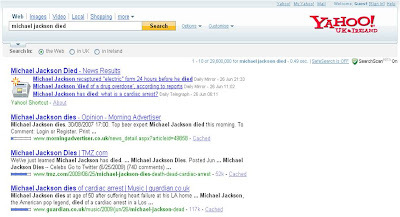 Not one of the Cuil.com homepage results for 'Michael Jackson Died' reference the King Of Pop - see for yourself here. Hakia bills itself as a 'semantic search' engine that understands more about what the user is looking for. 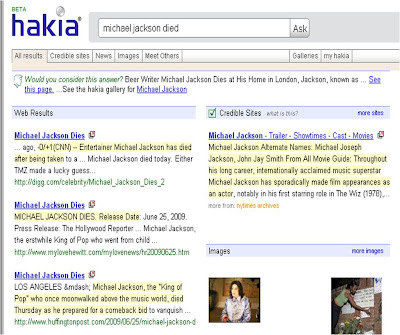 The Hakia results served up for 'Michael Jackson Died' are definitely more relevant than the other search engines referenced above. Hakia note the existence of Michael Jackson the writer, but seperate this off into a top section with the label 'would you consider this answer?' Impressive. Wikipedia has contributed to the Search Engine confusion. 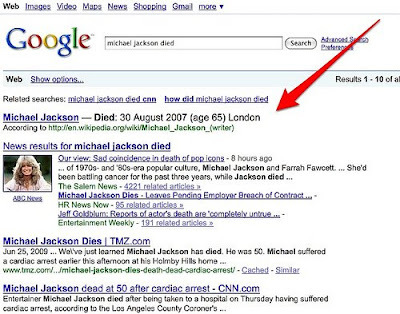 A seperate article for Michael Jackson (the writer) meant that since 2007 Wikipedia had been holding a story involving the phrase 'Michael Jackson Died' - it is easy to see how the Search Engines latched onto this as the most relevant result against the search 'Michael Jackson Died', especially in the short term. 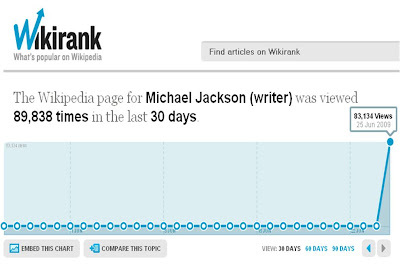 Indeed Wikirank shows that visits to the profile of Michael Jackson the writer increased by 31,995% on June 25th. This 'other Michael Jackson' Wikipedia profile was visited 83,134 times on 25th June - even though it has nothing to do with the King Of Pop. 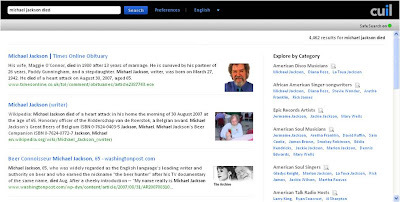 'Michael Jackson Died' shows the difficulty in offering semantic / real time search - the explosion of searches for Michael Jackson in the hours after his death were clearly aimed at finding information around Michael Jackson the singer, but Search Engines struggled to ignore their archive information and focus on the breaking news. Real time vs relevance is a difficult balancing act, but one that Search Engines will have to solve sooner or later.